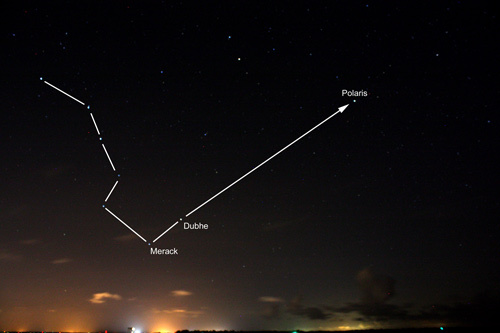 The Big Dipper, a seven-star grouping, is probably the constellation best known for use in finding Polaris. Shaped like a giant water dipper, complete with a long, curved handle, the Dipper circles Polaris in the sky's northern region. Merak through Dubhe. Continue the line straight out--five times the distance from Merak to Dubhe. At latitude 41 North and above, the Dipper never sets, but is seen all night long continuously circling Polaris in a counterclockwise fashion. Farther south, however, the Dipper disappears at least for a time under the horizon in its path around the sky's northern pole. A star that never sets is said to be "circumpolar." To find Polaris from the Dipper, look for the two stars located at the end of the Dipper's cup, farthest from the handle. The star at the bottom of the cup is named Merak (MAIR-ack), while the star at the cup's top is called Dubhe (doob-AY). These are the "pointer" stars, so named because an imaginary line between points to Polaris. To see this for yourself, draw a line in your mind's eye from Merak through Dubhe. Now, extend this imaginary line out five times the distance from Merak to Dubhe, and, assuming the sky is clear, you'll find Polaris. If the north sky is obscured from view by clouds, trees, or anything else, you can still find north. Just extend the proper length line (see above) from Merak through Dubhe. Where that line ends is approximately where you'd find Polaris if you could see it. From that spot in the sky, imagine a line extending down to the horizon. Where that line touches the horizon is true north.